In this Japanese name, the family name is Okakura. 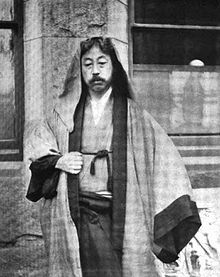 Okakura Kakuzō (岡倉 覚三, February 14, 1862 – September 2, 1913) (also known as 岡倉 天心 Okakura Tenshin) was a Japanese scholar who contributed to the development of arts in Japan. Outside Japan, he is chiefly remembered today as the author of The Book of Tea. Born in Yokohama to parents originally from Fukui, Okakura learned English while attending a school operated by Christian missionary, Dr. Curtis Hepburn. At 15, he entered Tokyo Imperial University, where he first met and studied under Harvard-educated professor Ernest Fenollosa. In 1889, Okakura co-founded the periodical Kokka. In 1887 he was one of the principal founders of the Tokyo School of Fine Arts (東京美術学校 Tōkyō Bijutsu Gakkō), and a year later became its head, although he was later ousted from the school in an administrative struggle. Later, he also founded the Japan Art Institute with Hashimoto Gahō and Yokoyama Taikan. He was invited by William Sturgis Bigelow to the Museum of Fine Arts, Boston in 1904 and became the first head of the Asian art division in 1910. Okakura was a high-profile urbanite who had an international sense of self. In the Meiji period he was the first dean of the Tokyo Fine Arts School (later merged with the Tokyo Music School to form the current Tokyo University of the Arts). He wrote all of his main works in English. Okakura researched Japan's traditional art and traveled to Europe, the United States, China and India. He emphasised the importance to the modern world of Asian culture, attempting to bring its influence to realms of art and literature that, in his day, were largely dominated by Western culture. In Japan, Okakura, along with Fenollosa, is credited with "saving" Nihonga, or painting done with traditional Japanese technique, as it was threatened with replacement by Western-style painting, or "Yōga", whose chief advocate was artist Kuroda Seiki. In fact this role, most assiduously pressed after Okakura's death by his followers, is not taken seriously by art scholars today, nor is the idea that oil painting posed any serious "threat" to traditional Japanese painting. Yet Okakura was certainly instrumental in modernizing Japanese aesthetics, having recognized the need to preserve Japan's cultural heritage, and thus was one of the major reformers during Japan's period of modernization beginning with the Meiji Restoration. Outside Japan, Okakura influenced a number of important figures, directly or indirectly, who include Swami Vivekananda, philosopher Martin Heidegger, poet Ezra Pound, and especially poet Rabindranath Tagore and heiress Isabella Stewart Gardner, who were close personal friends of his. Translation of work in Esperanto. ^ Gosling, Andrew (2011). Asian Treasures: Gems of the Written Word. National Library of Australia. p. 77. ISBN 978-0-642-27722-0. ^ Rupert Richard Arrowsmith, "The Transcultural Roots of Modernism: Imagist Poetry, Japanese Visual Culture, and the Western Museum System", Modernism/modernity Volume 18, Number 1, January 2011, 27-42. ISSN 1071-6068. ^ Okakura, Kakuzō (1903). The Ideals of the East with Special Reference to the Art of Japan. London: J. Murray. p. 1. ^ a b Okakura, Kakuzō (1904). The Awakening of Japan. New York: The Century Co.
Bharucha, Rustom. Another Asia: Rabindranath Tagore and Okakura Tenshin. New York: Oxford University Press, 2006. ISBN 0-19-568285-8. "We Must Do a Better Job of Explaining Japan to the World". Asahi Shimbun, August 12, 2005. Benfey, Christopher. The Great Wave: Gilded Age Misfits, Japanese Eccentrics, and the Opening of Old Japan. New York: Random House, 2003. ISBN 0-375-50327-7. "Japan as Museum"[permanent dead link] An essay by famous intellectual Kojin Karatani. This page was last edited on 6 March 2018, at 16:20 (UTC).